Hi IronLucario! Welcome to the forums! Hi there! Welcome to the forums! I hope to see you around! Cool, another new reader! Hello and welcome in the forum, IronLucario. Welcome to the forums, IronLucario! Have a nice time here and if you have any questions, don't hesitate to ask. Welcome to the forums, Bandit and IronLucario! Hope you enjoy it here! Hi, I'm kinda new to the forums. Actually, I discovered the webcomic back in 2010 and lurked around a bit before getting distracted by other things. Anyway, a little about myself: My favorite character is Tiger with Res and Peanut tying for a close second (I find Tiger and Res to be the most relatable characters to me, personality-wise). I have a form of autism called Asperger's Syndrome so I may seem a little out there at times. My favorite band is Poets Of The Fall but I also have a soft spot for new wave, synthpop and AOR music in general (I love pretty much any music from the 80s). I'm very sarcastic and have a bit of a dark sense of humor. Oh yeah, and I'm also a furry. Hi there! I've seen you around. Actually, you've been in the forums longer than I have. Also, I also have Asperger's Syndrome, and I'm pretty sure a bunch of others here are as well. I find it doesn't show as much online as it does in person. One of the reasons I like talking on the forums, the HP telegram chat, and the HP discord chat. Yeah, I created my account almost a year ago but wasn't really wasn't that active on it until just last week. Well I'm glad you've decided to be more active. I hope to see you around a lot more! Glad that you decided to be more active. Hope you enjoy your time here! If you have any questions, go ahead and ask any of us mods. Finally welcome tot he forums, CanzetYote! Hope you have a lot of fun here! It's nice you started to post here. Hello and welcome, CanzetYote. I've just realized that I never did this- whoops. I suppose this could be my official introduction to the forums even though I've already commented on stuff here and there. I found out about Housepets! from a friend back in summer 2016 but only made an account on the forum earlier this year because that's when I really started getting into it. Uh....greetings. I'm Jolty. I just joined, as a friend of mine directed me here saying I would "enjoy the comic, and it sort of looks like my art style." Indeed, I love this comic! I spent my entire Sunday reading it, trying to catch up (I still have plenty to read.) Uh, anyways, it's nice to meet everyone. I don't know if I am supposed to myself as a person, and talk about myself a little bit or something, but to refrain from sounding snobby, I will wait. Welcome to the forums, Jolty! I don't see anything wrong with telling about yourself, as long as you're not presenting yourself as "high and mighty" and if you're comfortable doing so. Hope you enjoy your stay here, and if you have any questions, feel free to contact the moderator team. Ah, thank you. Believe me, I am far from high and mighty, as you put it, but I just wanted to check to make sure it was appropriate to put this here. Though, I will refrain from posting often, as many of the people here, I have noticed, are beyond my age group, and I want to refrain from making people uncomfortable. Anyways, I'll get this over with so you can move onto other folks. Greetings. My name is Jolty. 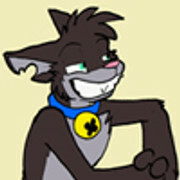 I am a artist, who was joyful when I realized that the art style of HousePets was much like my own, which means I can avoid contacting the mods or creators, and wasting their time asking questions on "improving my art skills." I am also an avid reader and writer, have an obsession with space, science, physics, and the supernatural (UFO's, monsters, etc.) I also like to role-play, though I have slowed down as of late, because I have found no interesting new role-players or role-plays to be a part of, since I despise romance role-plays, and many of my former role-play partners have that as their main theme. I apologize, I went on a bit of a tangent there, but I digress. If you would like to contact me, just send me a private message, and I will possibly respond, depending on if I want to be socially interactive that day. Oh, and I am a cat person. Just thought that is kind of an important thing to know on a site like this one. Thank you for reading this, I apologize for wasting your most likely already busy day. The age range around here runs quite the spectrum, but the concern is appreciated. We do have a role play section here, as you likely have noticed (if not, yeah, we have one), so if you feel like you're up to something to do, look them up, speak with the game masters, and see if they'll take you. Thanks, but it is quite alright. I simply wished to know what this place was about, and I received my answer. I will probably never come on again, I would most likely just be annoying and problematic to the more experienced people. if you can handle a an encouraged update rate of at least 1 post per player a day, we have a superhero RP going. if you want something slower we've also got a "magic pets trying to blend in with the mundane" themed one that updates in seemingly random spurts, one that feels like a clone of Startrek (As in the GOOD versions from the 70s 80s & 90s.) with bits of other scifi series thrown in, a few fan rps for other vaguely tangentially related series like redwall or zootopia, and about a dozen RPs i haven't figured out how they work yet. ...despite having made completely unfitting, currently abandoned, characters for two of them that i still don't know what to actually do with. Welcome to the forums, Jolty! Um, thank you, I suppose. It's been pleasant to be here thus far. Hi and welcome! It's great to have you! Quite honestly we have people here with ages from, I think, twelve to at least fifty so whatever your age you're bound to fit in! We'd love to see some of your art and stories too so do feel free to share them in the art thread/media median if that's something you'd be comfortable doing! If not, then no worries. No pressure at all! Now also in this place: Welcome to the forums, Jolty! Have a great time and much fun here. Thank you, I suppose. It is pleasant to be here. I just don't get why people keep greeting me. I am just a new user, nothing particularly special. I have no issues with with it, on the contrary, it is quite pleasant. It just confuses me why I am receiving so much attention. New people don't come to the forums very often, and many who do post once and then never post again. I greet all new people enthusiastically because I'm always looking for new friends here. Before the forums, I had very few and I often avoided them. This is the first group of people I've actually wanted to talk to and interact with. I'd like to see that group grow! well this isn't called the introduction thread. that's just a necessary step before the true purpose can be achieved. and that is welcoming the new user. Hello and welcome here, Jolty-Kun. It's just our tradition to welcome new users who present themselves in this thread. Hi there! I've been reading the comic since 2009, and I finally decided to make an account since the community seems pretty fun (also I spent WAY too much time writing individual Arabic characters in Google Translate for today's comic to pass it up). I'm RapidStrike, but sometimes I go by "Golly". I like doing art stuff sometimes, and I enjoy programming/software development. I may not post much on here (I honestly haven't touched a bulletin board forum in months), but I do constantly use Discord and Tumblr for communication and making bad posts. Doing good, how are you? Welcome to the forums, RapidStrike. Welcome to the forums RapidStrike! Hope you'll have a lot of fun here and if you have any questions, don't hesitate to ask. We're here to help. I'm doing fine, thanks. Hope the same for you. WELCOME TO THE FORUMS!!!!!!!! ! !! !!! !!!!! I hope you have fun here! It's a good community ... sorta like Babylon Gardens. Welcome here RapidStrike. Good to know another old reader. Greetings again. I am SilverballJim. I am going to be more active on the forums, and I will be sure to practice the fan art. I wasn't active before but I will try again to continue the battle. WELCOME BACK TO THE FORUMS SILVERBALLJIM!!!!!!!!!!!!! !!!!!! !!! !